Make the most of a pleasant "farmhouse holiday" in the Waldecker Land region. 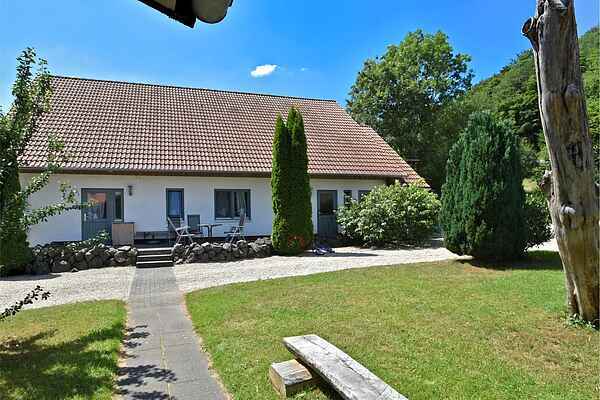 This beautiful holiday farmhouse is embedded in the stunning landscape of the Central Uplands in Hessen, right at the Kellerwald-Edersee National Park. Here you can enjoy everything about your well-deserved holiday. This ground floor apartment is comfortably and fully furnished and situated in a separate building in the courtyard. Get together on the sunny terrace complete with garden furniture. Surrounded by ponies, cows, chickens and fluffy bunnies, the farmhouse is a great experience for both kids and grown ups. Children and adults alike will have fun, excitement and variety while staying here. With 5,000 square metres, there's lots of space for children to play onsite, so they can experience the farmhouse atmosphere up close and personal. The ponies are available for an outing at no extra cost. A self-service "Vesperhütte" (rustic eatery) on the farm is open 24 hours a day. In the area there are well-signposted cycle and hiking paths, covering many kilometres. The destination is also an ideal base for discovering the new 155km long Kellerwaldsteig path on foot. Popular day trip destinations: Kellerwald-Edersee National Park (2km), spa town Bad Wildungen (10km), timber frame town Fritzlar (20km), Edersee with a water park, wildlife park summer toboggan run (20km), Korbach (40km), Marburg (50km), Kassel (60km). Find out for yourself and experience a well cared-for "farmhouse atmosphere" up close and personal. As a guest of ours you receive discounted entrance fees to the "QuellenTherme" with its bathing complex and wellness lounge, only 5 km away.